A moment during the meeting between the head of the micro-campuses of the University of Arizona, Brent White; the head of mobility also from the University of Arizona, Harmony DeFazio, the Vice-Rector for Internationalization of the URV, John Style, and the Rector of the URV, Maria José Figueras. 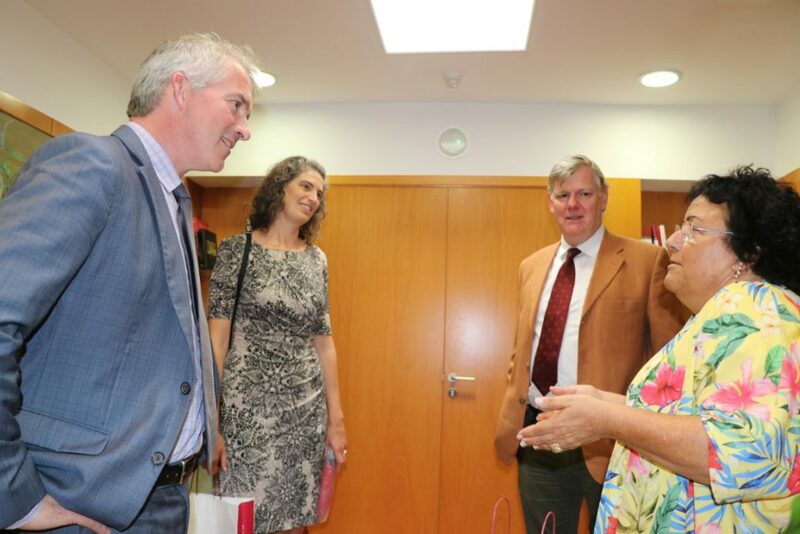 A delegation from the University of Arizona (United States) has visited the URV to put forward a proposal for a programme between both universities that would enable them to offer joint bachelor’s and master’s degrees. The aim is for the American university to establish a micro-campus at the URV, just as it has at other universities. This would give students from the University of Arizona the opportunity to study at the URV and URV students the chance to study their specialty at one of the campuses where the UA has established a micro-campus. Furthermore, some subjects would be jointly taught by teaching staff from the URV and the UA. The aim is to offer a high quality programme that would enable students to interact. The individual responsible for these campuses, Brent White, and the head of mobility at the University of Arizona, Harmony DeFazio, met with the Rector of the URV, Maria José Figueras, and the URV’s Vice-Rector for Internationalization, John Style, on 18 September to discuss a pilot project for the proposal involving one or two courses that are in high demand.